Semele was a daughter of Poseidon's grandson, Cadmus, the King of Thebes, and Harmonia. Through Harmonia, Semele was a granddaughter of Ares and the cousin of Aphrodite, and therefore, great-granddaughter of Zeus. Do you remember the genealogy of Achilles? Zeus was his great-great-great-grandfather once and great-great-great-great-grandfather twice on Achilles' father's mother's side. Lusty Zeus even wanted to mate with Thetis, Achilles' mother but was scared off when he heard that her son would eclipse his father in fame. Considering the number of times Zeus insinuated himself into the genealogies of the heroes, and the founders of the great cities, you'd think he was trying single-handedly to populate Greece. Despite the fact that Zeus was (old enough to be) Semele's great-granddad, Semele, and Zeus became lovers. Hera, jealous as usual — and, as usual, with a cause — disguised herself as a mortal nurse. Working in this capacity at the Theban court of King Cadmus, Hera as nurse Beroe gained the confidence of Princess Semele. When Semele became pregnant, Hera-Beroe put an idea into her mind. "The most beautiful woman in the world, Psyche, was given as a bride to a mysterious creature (whom she did not know was the son of Aphrodite -- Cupid) as a punishment for detracting from the worship of the goddess Aphrodite. Life was grand even though Psyche was only allowed to visit with her husband in the cover of darkness. Psyche's two jealous sisters did what they could to spoil Psyche's nighttime fun. They told Psyche her husband was probably a hideous monster and that was why he didn't want her to see him. Persuaded that they might be right, Psyche disobeyed the rule set down by her divine husband. To get a clear look at him, she shone a lamp on his face, saw the most beautiful being she could have imagined, and dropped a bit of lamp oil upon him. Burned, he instantly awoke. Seeing that Psyche had distrusted and therefore disobeyed him (actually, his mother Aphrodite), he flew away. For Psyche to regain her gorgeous husband Cupid, she had to placate Aphrodite. This included making a return trip to the Underworld." Like Psyche's jealous sister, the goddess who is a past-mistress of jealousy, Hera, sowed seeds of doubt and jealousy in Semele. Hera persuaded Semele that she wouldn't know if the man who was presenting himself to her as Zeus was a god unless he revealed himself to Semele in godlike form. Furthermore, Semele wouldn't know if Zeus loved her unless he made love to her in the same way he made love to his wife, Hera. Semele was young, and pregnancy can do odd things, so Semele, who probably should have known better, prevailed upon Zeus to grant her (or rather Hera-Beroe's) request. Why did Zeus oblige? Was he vain enough to want to impress the young woman? Was he foolish enough to think it wouldn't hurt? Did he know he could convince anyone that he was under an obligation of honor to do as Semele requested? Did he want to be both mother and father to the unborn child? I'll let you decide. 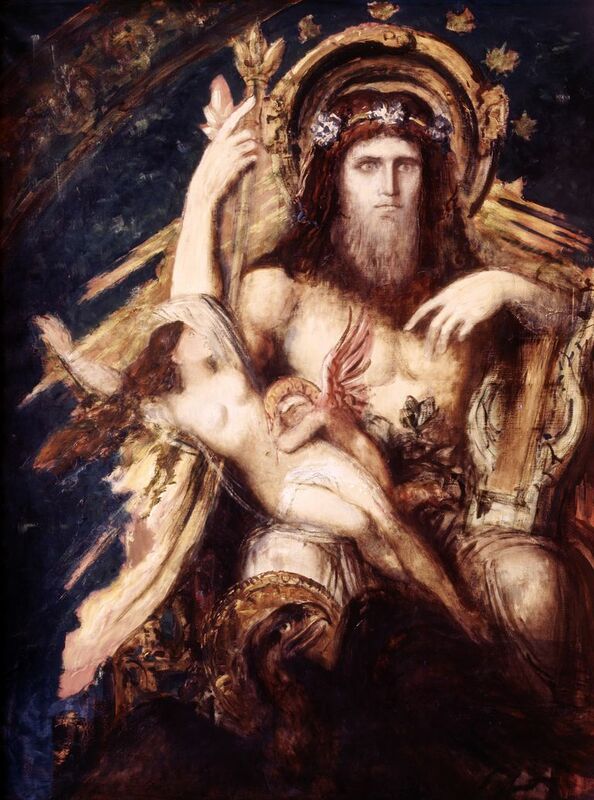 Zeus, revealing himself in his full thunder-bolting glory, killed the frail human Semele. Before her body was cold, Zeus had snatched from it the six-month unborn child and sewed it into his thigh. When the thigh-sewn child was born, he was named Dionysus. Among the Thebans, rumors — planted by Hera — persisted that Zeus had not been his father. Instead, Dionysus was the entirely mortal son of Semele and a mortal man. Dionysus dispensed with any mortal who cast aspersions on his mother's reputation by doubting that her sexual liaison had been divine — although why mating with the philandering Zeus confers honor in mortal circles is beyond me. What's more, with the permission of Zeus, the dutiful Dionysus went to the Underworld and raised his mother Semele from the dead so that, like Psyche, she could live -- along with her child, among the gods.